I think your MatchGirl and Boyfriend have come to a decision when it comes to a sofa for the new place. On advice of a few friends (Thank you, friends! 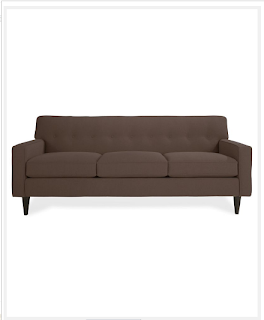 ), we looked at Macy's and found the modern looking Corona sofa. It comes in pear, stone and cafe noir (the brown pictured above). Boyfriend is partial to the pear, which is a nice shade of green, but I am leaning towards the brown, as I think it keeps more decorating possibilities open. yes. liking the weird gray brown. practical yet tasteful.